At Silverman Opticians, our optometrists can give advice on the treatment and management of dry eye syndrome. Dry eye syndrome (also known as keratoconjunctivitis sicca, or simply dry eyes) occurs when there is a problem with the tear film that normally keeps the eye moist and lubricated. Diagnosis of dry eye syndrome can be made from the symptoms and an examination of the front of the eye. A very thin layer of mucous is secreted by cells distributed across the eyes surface. It forms a sticky base layer, holding the tears against the eyes surface. The watery layer is the main body of the tears. It contains nutrients and essential proteins and is made by the lacrimal gland. When the larcrimal gland is stimulated from pain or wind or emotions, the eye may become watery. A thin oily layer, keeps the tear surface smooth and prevents evaporation of the watery layer. It is produced by rows of meibomian glands, running vertically in the upper and lower eyelids and opening just behind the roots of the lashes. The tear film is spread across the surface of the eye by the eyelids when you blink, and drains into the tear ducts (situated in the corner of the upper and lower lids) and then into the nose. Dry eye syndrome is the most common eye disease affecting around 5% of the population. The condition occurs when the eyes do not make enough tears, or more commonly because the tears evaporate too quickly. Evaporative dry eye frequently occurs because the meibomian (oil) glands located in the eye lids are blocked or abnormal. The oily tear layer breaks down allowing the watery layer to evaporate. This leads to dryness, inflammation and irritation. If the main problem is a blockage of the oil-secreting glands, then the condition may be called blepharitis, meibomian gland dysfunction or lid margin disease. Ageing. Dry eyes are more common with increasing age (affecting up to 1 in 3 elderly people) as tear production decreases with age. It affects women more than men with up to 10% developing dry eyes after the menopause. Medication. Some medicines sometimes have a side-effect of causing dry eyes. Such as : diuretics (water tablets); some antidepressants or treatments for anxiety or other psychological problems; antihistamines; the contraceptive pill & beta-blockers. If you suspect that a medicine you are taking is causing dry eyes, tell your doctor. Illness. Some people develop dry eyes as a symptom of a more general disease such as: rheumatoid arthritis, systemic lupus erythematosus (SLE), and Sjögren’s syndrome. Environmental conditions such as wind, heat and low humidity e.g. from central heating or air conditioning. Low blink rate, often combined with long hours at a computer, TV or microscope. Incomplete closure of the eye lids when blinking or sleeping. Damage to the outer part of the eyes or eyelids from disease or injury. Unknown. Some people simply produce less than the normal amount of tears. Irritation – dry, sore, gritty, burning sensations. Slightly blurred vision from time to time. Contact Lenses may become uncomfortable. Ocular lubricants such as artificial tears, drops, gels and ointments can be very effective at relieving the symptoms, whilst treatment is directed at the underlying cause. In extreme cases specialist treatment may be required. At Silverman Opticians we offer a Dry Eye assessment to see what the best treatment might be. Eye drops and gels may be required very frequently at first and continued regular use may be necessary to keep symptoms away. There are several formulations available with different ingredients. Multi-dose bottles usually contain preservatives which can themselves irritate your eyes when taken frequently. People often find that some preparations help more than others, so if you don’t have success at first ask your pharmacist or eye care specialist for an alternative preservative free formulation with a different lubricating agent. Ointments and more viscous gels can be instilled at bedtime for overnight use to prevent the eye lid rubbing or sticking to the eye during sleep. They are not practical for use during the day as they can blur vision and are not recommended for use at the same time as eye drops which may not work so well on top of an ointment. More specialist formulations are available from eye care specialists for people with an imbalance in the oily or mucous layers within the tear film and in extreme cases medication is necessary. Long term regular lid hygiene is crucial in managing blepharitis and reducing inflammation and dryness from evaporation. A regime of warm compresses, followed by massage and cleansing is usually recommended once or twice a day depending on severity. Warm compresses – loosens debris on the eye lids and melts the oils blocking the glands, making them easier to express and clean. Soak a new cotton pad in warm (not too hot!) boiled water and apply to each eye for 5 minutes. Alternatively, commercially available heat pads can be used. Lid massage – helps improve meibomian gland function. Gently rotate a clean finger down the top lid and up the bottom lid, expressing oil from the meibomian glands along the length of each lid. Lid cleansing – removing debris reduces inflammation. Gently clean along the lid margin and remove any debris from the lashes. Commercially available ‘lid wipes’ are widely used. Alternatively, a cotton but with warm boiled water and a ‘drop’ of baby shampoo or a ‘pinch’ of sodium bicarbonate can be used. The Tear drainage canals can be blocked temporarily with plugs or more permanently with surgery. Avoid air conditioning or sitting directly in front of a fire. Eat a healthy diet including flaxseed oil and omega-3 fats. Dry eye syndrome may be uncomfortable, but does not usually cause severe pain. Complications are uncommon. 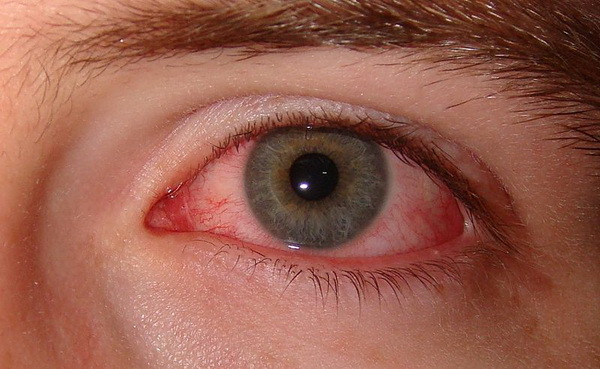 Inflammation of the conjunctiva (conjunctivitis) or the cornea at the front of the eye (keratitis) sometimes occurs. In rare cases, severe untreated dry eye syndrome can cause scarring of the eye’s surface, leading to visual impairment. Certain kinds of contact lenses can help to treat dry eye though most contact lenses make the situation worse. If your eyes are dry and uncomfortable then you should minimise contact lens wear and come for an urgent contact lens aftercare appointment. There may be an alternative type of contact lens which suits you better. Some unpreserved dry eye formulations are suitable for contact lens wearers though many eye drops should not be used whilst wearing contact lenses as the preservatives in the solutions can cause further problems. ‘If in doubt take them out’ and seek specialist advice.